Whether you’re out for the long haul, or just a few days, one of the available campervan showers can be your saving grace. Aside from social acceptance and just wanting your partner or kids to get within 10 feet, there can be health concerns… So it’s not just about comfort, it’s crucial to stay clean. Most of all, few things are as satisfying as a good shower after a day of hiking, playing on the beach, or just driving all day. 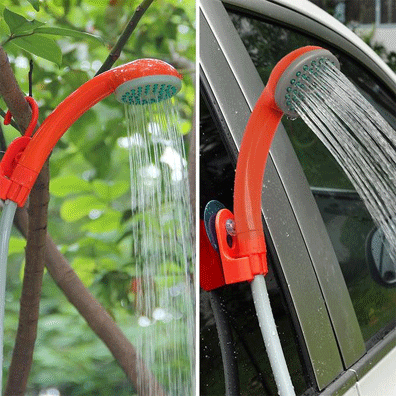 This guide is designed to help you choose the best campervan shower for you and your family. There are many factors to consider, many brands and styles and many options. 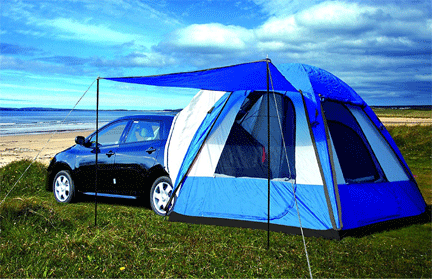 Here are some crucial guidelines to keep in mind before purchasing a portable camping shower. How the water is pressurized, or what creates the flow from the nozzle? If yes, how? How long will the shower produce heated water? If not, are you traveling in warm climates? How tough are you, your partner, your kids? Durability. Road life can be tough on any equipment. Campervan storage space is limited (even if you have a link: cargo box, so it’s important to consider the size and portability of the shower you choose. Fortunately, there are many showers to choose from. 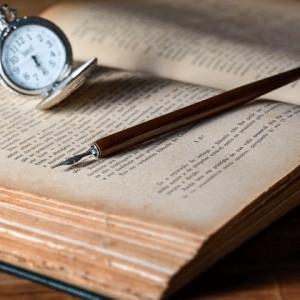 This list will familiarize you with the options. These showers require either hand or foot pumping. 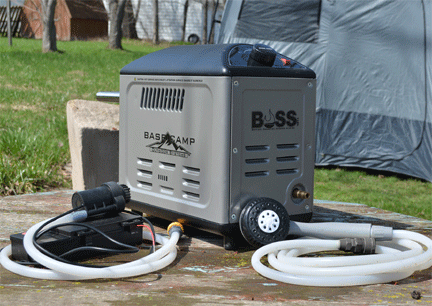 The foot pump models are leading the market in popularity right now. This is because it’s easier to give a few foot pumps than it is to operate a hand pump with soapy hands. The real (and perhaps obvious) beauty of these camping showers is that they do not require electricity. 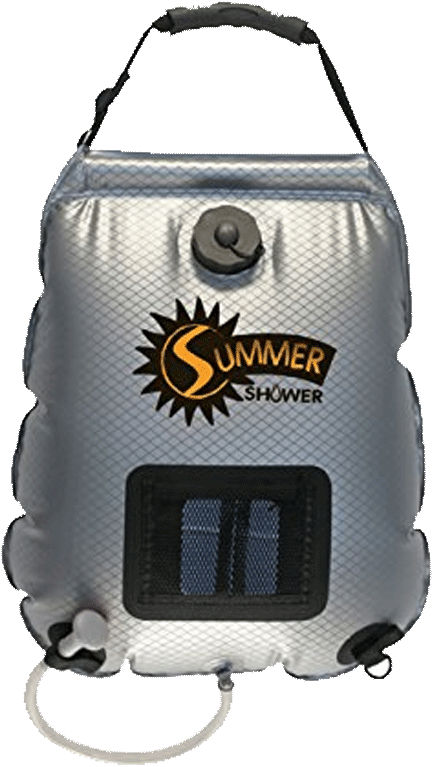 Manul pump showers do require a bit of work, but they tend to be simple and easy to use and the flexible foot pump models fold down to a very small, packable size. 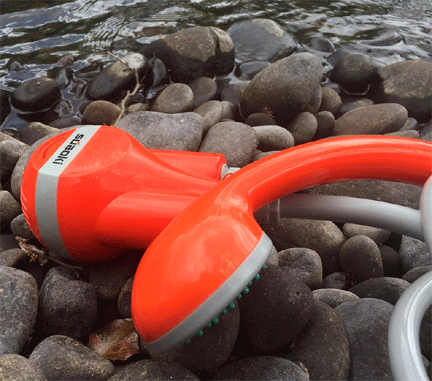 Portable electric campervan showers can be wonderful on a long outing. 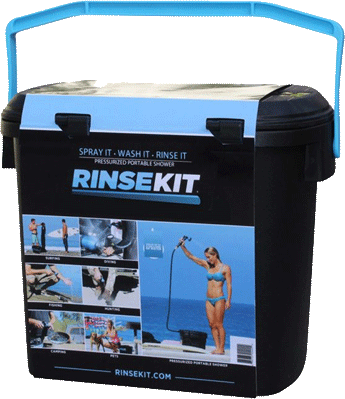 There are many portable electric showers available to fit any need. 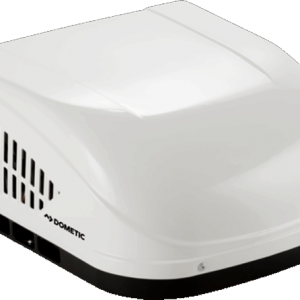 If you have a larger van such as a Sprinter or a high roof Ford Transit van, consider installing a permanent electric shower. 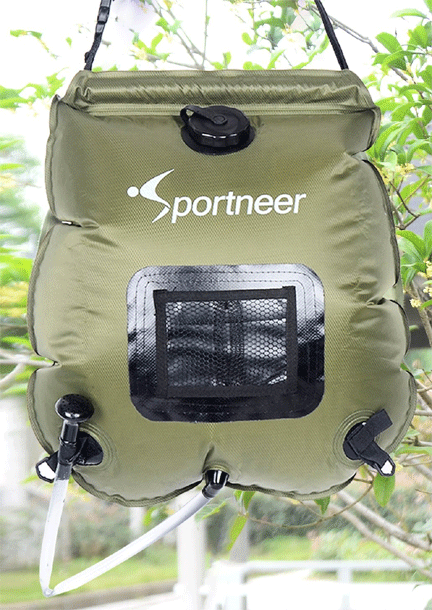 For the purposes of this article, I’ll focus on portable electric camping showers. 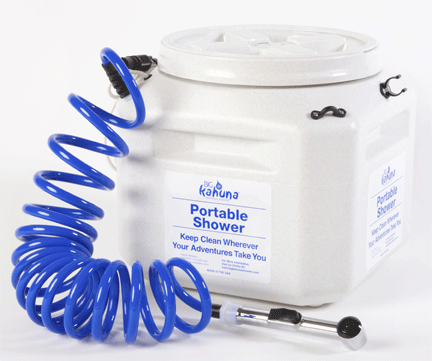 A wide variety of sizes, functions, power types and pressures are available in portable electric showers. Some heat the water as it’s being used, others just pump water. No pumping required, just plug in and get clean. Must have a source of power. 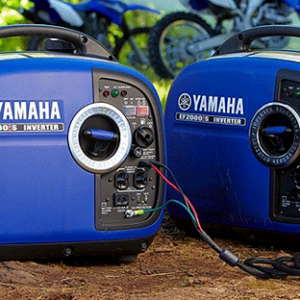 There are AC, DC and combo power models available. 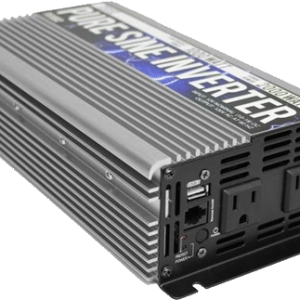 If you don’t have van dwelling electricity installed, it’s important to know what power connections will be available during your trip. “Solar”, in the case of heating the water in campervan showers, can be a very loose term. Most solar showers are simply dark colored material that absorb sunlight. 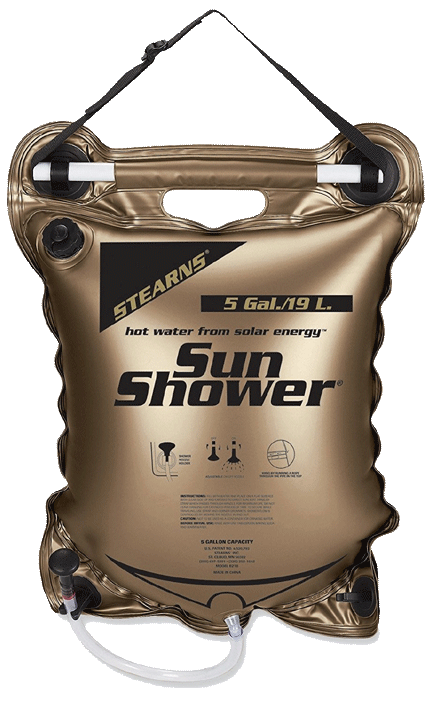 So don’t get hopes up that a solar shower includes a solar powered electric pump, it doesn’t. If you want your electric pump shower to be powered by solar power, you’ll have to choose an electric portable camp shower and plug it in to the solar power you’ve installed in your van. These are the most portable camping shower setups. They fold down to a very small package and takes up the least space of all the options. 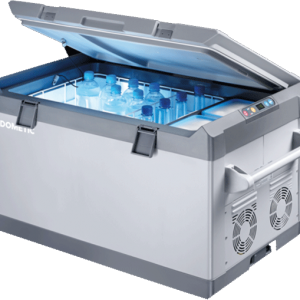 There’s a wide range of models with equally ranging pricing available. 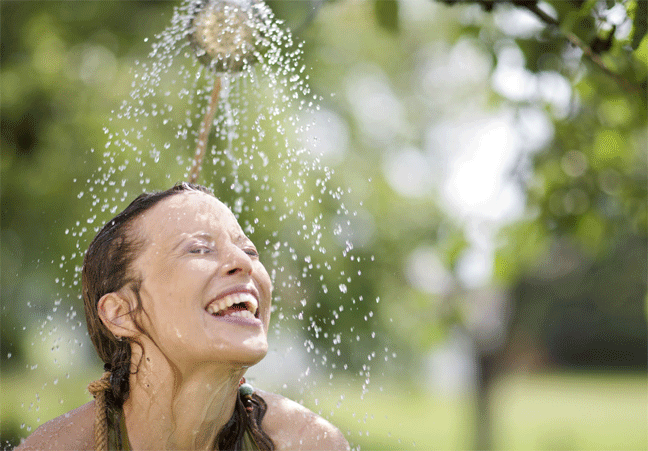 If your solar camp shower will be rarely used, you might choose a lower priced option to test the concept. One downside is that their all gravity fed, and so pressure is typically not great. Also, since they need to be hung up to a certain height (5 feet or so), it can be a challenge to lift all that water. No sun, no heat. Here’s a little trick I figured out: If there’s no sun and you’ve got a heater running, keep the shower, with water, in the van over night so you’ll at least have a room temp shower in the morning. One concern that’s often not mentioned about showing in the wild is privacy. You might consider a portable shower tent to resolve this. 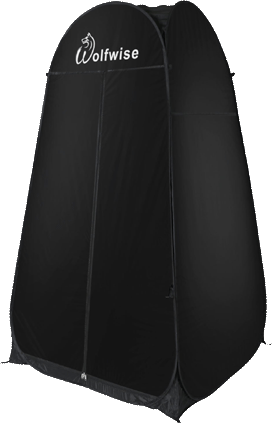 A shower tent can also be used with your portable camp toilet. 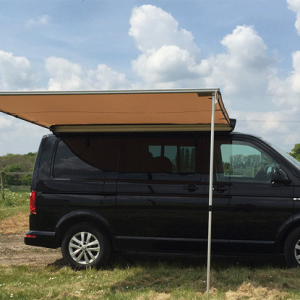 A campervan tent attachment can also double as privacy for showering. Be sure to read reviews on Amazon of the various showers you’re considering. A tip I have for this is to look at the 2 to 4 star rated reviews as they tend to have the most thoughtful comments. You might consider getting both a lower priced solar shower and a more luxurious electric model. That way, even if you don’t have power, you can get a solar shower and when you do have power, you’ll have a more fulfilling shower. 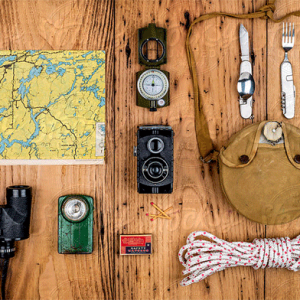 How durable do you need your gear to be? Do you have room for a larger model? Solar with gravity feed: Smallet packing. Wide range of prices. No sun, no heat. 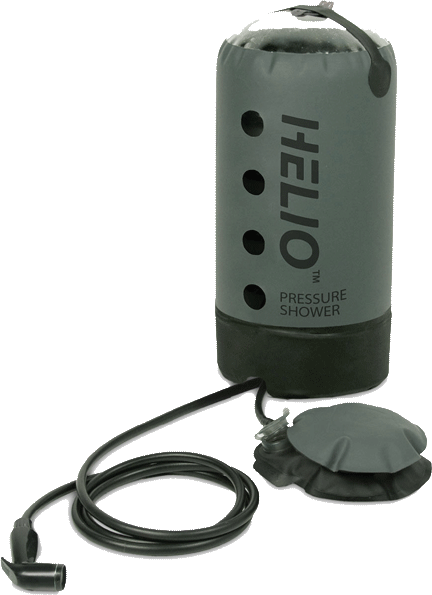 Powerful shower head and water pump on the other end with a S-hook, suction cap, a 3M power cord and hose. Upgraded rechargeable battery is waterproof and separate from the pump. 2200 mah rechargeable battery good for 1 Hour of use on full charge.